While much of today's Google IO keynote was spent on Google Home, the Mountain View company's answer to the Amazon Echo, there was a brief moment where they talked about the future of Android TV. Now entering its third year of life, Android TV will soon add picture-in-picture, live TV DVR and support for high dynamic range (HDR) content to its repertoire of tricks. "Many of you have also asked for the ability to display more than one at the same time. We've invested a lot of effort in redesigning our window management framework and N," said Dave Burke, Vice President of Engineering at Google. "And we're introducing two new powerful windowing modes with this release: split screen and picture-in-picture." During the demo, Burke minimized a YouTube video on Pac-Man he was watching and then proceeded back to the home screen where he began a download of the game. "I can put the live content into picture-in-picture mode to keep watching it, and then go ahead and perform a voice search for Pac-Man. This will then give me an option to install the game from the Google Play Store all at the same time while watching the content," Burke said. 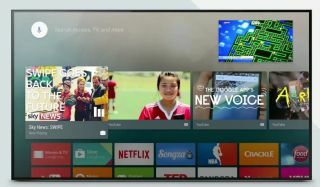 The ability to multi-task has always been something Google products have excelled at, so it's perhaps somewhat unsurprising that it became a priority for its Android TV operating system. What wasn't talked about at today's event, though, was the addition of HDR support. That news came by way of GPU giant, Nvidia. In a press release sent to techradar, Nvidia says that it has plans to leverage the technology in its Nvidia Shield and will be the first streaming video device to support the technology. The Shield, if you recall, became the first video streaming device to offer 4K resolution when it launched last year, and it appears as though it will continue leading the field when HDR supports hits later this year. Also in the works is live TV recording through a suite of recording APIs that will come built into Android TV. Theoretically, this could enable developers to release apps that will allow you to record content in a similar fashion to TiVo. Unfortunately however, not much was said about this functionality, only that it would launch with the next update to Android TV. Finally, Google announced that it would add several new channels to Android TV, including apps for CNN, Comedy Central, MTV, Freeform, Nickelodeon, Spotify, STARZ, WATCH ABC, WATCH Disney Channel, WATCH Disney Junior and ESPN. Hey Apple, maybe take a page from Google's book for the Apple TV?